The CFEE has its own mailing list. To subscribe (or unsubscribe): http://www.cfee.cnrs.fr/spip.php?page=newsletters&lang=en. 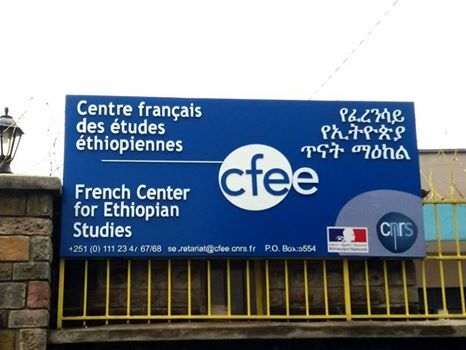 The French Centre for Ethiopian Studies is located in Addis Ababa, Arada sub city, Kebele 11 /12, house n° 1907, in the neighbourhood called JanMeda, between Menelik Hospital and Sidist Kilo. By taxi, from Menelik Hospital in the direction of Sidist Kilo, drive some 200 meters (pass the two police stations on your left), then find on your right a house whose door, fence and razor wires are painted in bright yellow. This is the place. Opening hours (administration): 9:00am – 12:30pm and 2:00pm – 5:00pm, from Monday to Friday. Opening hours of the library of Ethiopian studies Berhanou Abebe to the public: 8:30am – 12:30pm and 2:00pm – 5:00pm, from Monday to Friday.